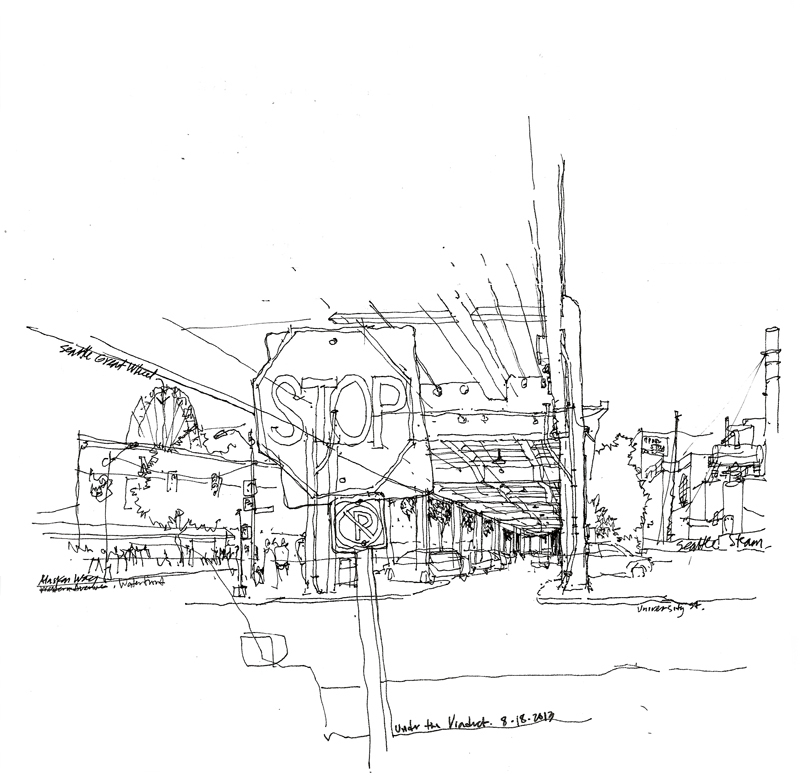 Here is a view from beneath the Alaskan Way Viaduct where University Avenue meets Alaskan Way, drawn at the monthly meeting of the Seattle Urban Sketchers yesterday. Built in the 1950s, the two-level highway is a critical connector to Fremont, Ballard, and other points in northwest Seattle. And driving on the northbound upper deck offers impressive views of downtown Seattle and across Puget Sound to Bainbridge Island the Olympic Mountains beyond. After the 2001 earthquake, civic leaders decided that the viaduct needed to be replaced for safety concerns. After studying various alternatives, including surface streets and bridges, it was finally decided after a long public process that a 2-mile long tunnel beneath downtown Seattle was the best option. On July 30th, Bertha, the world’s largest tunnel boring machine, began drilling operations. The viaduct is scheduled for demolition in 2016. I will miss it.